The “Soup Nazi” was probably not an unfamiliar site in many developing nations in the last century, minus Manhattan. A big cauldron filled with odd bits of animal parts, radishes, cabbages, and the most basic of seasonings, boiling away for hours upon hours, to be replenished at intervals with stock and more cabbages, until all the marrow escapes the carcass and into the soup. While many forms of soup have now become “exotic” must-haves or hangover cures for Sunday mornings, soup, at its inception, was the lifeblood of the working poor. Therein lies the true beauty of soup. I love Nikos Kazantzakis, not only for his fictional work (such as Zorba the Greek), but also for his travelogues. As if his eyes photo-captured every lasting detail, Kazantzakis masterfully portrays the vast layers of his destinations – its people, scenery, architecture, scent, and food. What made him an “expert” traveler (and even more gifted travel writer) was not merely his in-depth depictions and artful prose. What made him great was his willingness – and yearning – to get out the comfort of a car and walk the streets, smell the meat market, and chat with locals about anything and everything. Peking in the early 1900s was no easy place to travel. “On a cool square a multitude sits cross-legged. In the center, a girl, slender, with disheveled hair, holds the large scissors which she opens and closes continually while she sings and dances slowly. A harsh voice, a hyena howl, an incomprehensible harmony. An old woman sprawled on the ground, stooping, bald, plays a strange elongated lute. Nearby, an old man with glasses and sparse gray beard and two or three thick hairs on his upper lip is sitting on a stone reading a religious book. As he fans himself, his body from the waist up moves rhythmically with his monotonous voice in a lamenting lullaby. And all around, women listen to him, gaping, with bleary eyes plagued by flies. Sweltering heat. And across at the butcher shop the butcher hangs his jacket over a loin of beef. The wonderment of this passage is that Kazantzakis’ description of “food” is inseparable from its surroundings. The loin of beef, eggs preserved in lime, pickled vegetables, and sour fruit are almost painted in black and white with limited verbiage, while the old woman, old man, and coolies are written in splashes of color. And yet I feel as if I could taste the pickled vegetables. The eggs are right there, within reach of my grasp. My mouth already waters from the colorful fruit sprawled about on mats in this busy marketplace. Not from the words used to describe them, but from the accurate and lively depiction of that hot summer day in 1935. So what, then, is the true beauty of soup? The true beauty of soup is that, for many of them, it simply cannot be recreated from a “recipe.” A recipe is only useful for one purpose: to bring about a taste portfolio intended to be drawn out by its author. So if a recipe fulfills its purpose successfully, a cook will no doubt recreate the “flavors” of a soup, maybe even better than its original intentions. But what a recipe does not contain are the blood-soaked wars, ravenous famines, and suppressive dictatorships from which these soups were conceived. Take “gamjatang” for instance (first photo above). 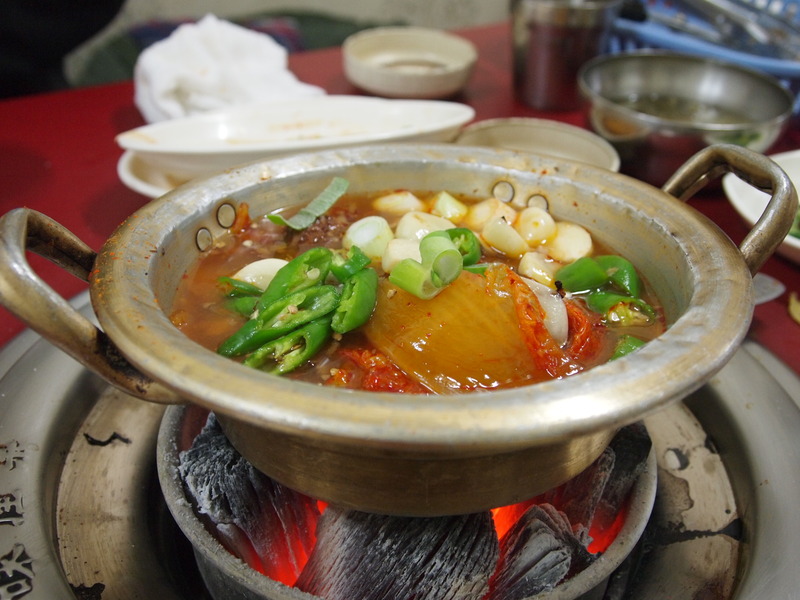 An exquisite Korean delicacy, this stew is made from pork spine, rehydrated Napa cabbage leaves, and peeled potatoes. 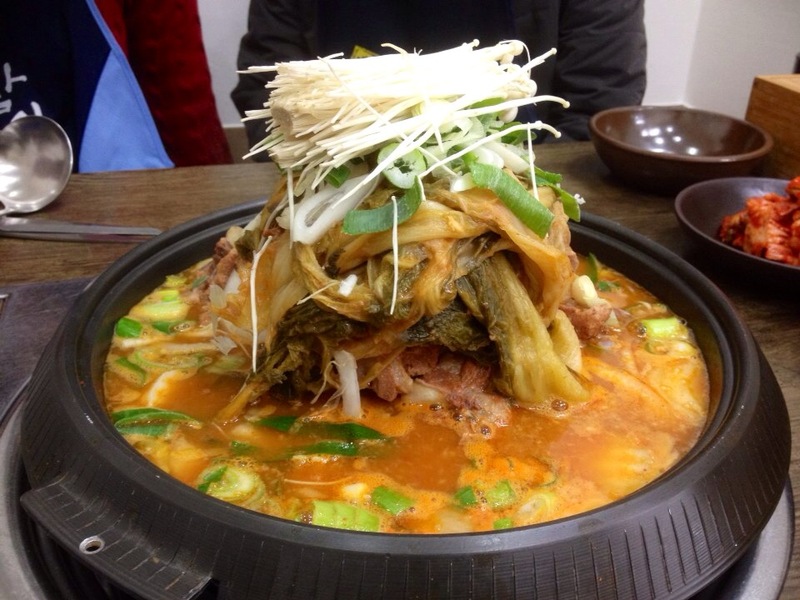 The soup – a culmination of pork marrow, dwenjang, garlic, and hours and hours of boiling – is simply divine. 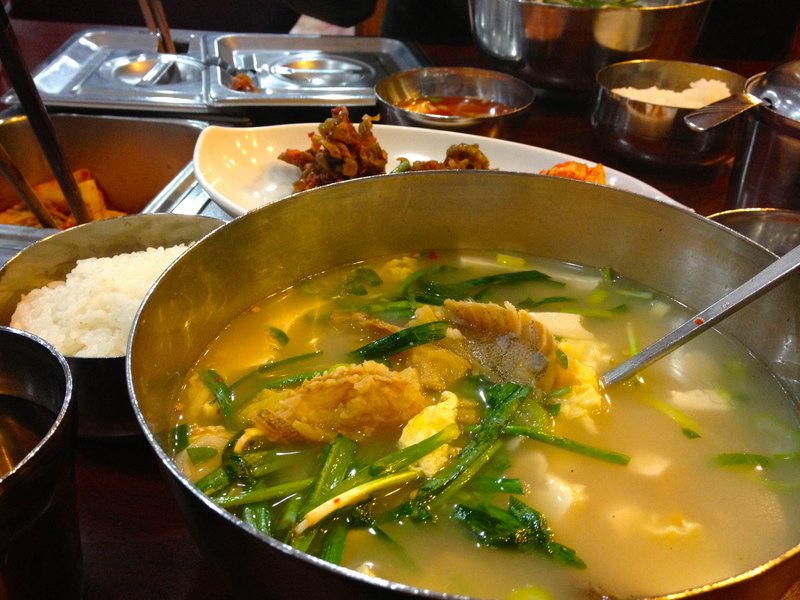 It is not a taste one can create easily in haste, and in my gastronomic experience thus far, there is not a single Korean restaurant in the U.S. that is worthy to be called a true gamjatang joint. While it is something I eagerly scavenge for these days, gamjatang was born out of utter poverty. Pork spine (and other odd bits of animals) was cheap and easy to get, and potatoes (“gamja”) were the staple for the poor. Napa cabbage leaves from last year’s harvest were hung to dry in the autumn wind, to be rehydrated during the winter. So during the crude winter months, when good eating meant nothing more than bowls of barley, folks would throw these together in huge pots with dwenjang and boil away. And voila, gamjatang (literally means “potato soup”). Many soups were born out of necessity – the necessity to eat, the unavailability of ingredients, the compulsion to multiply quantitatively. More from less. Soup is beautiful because it’s a story in a bowl. It’s not just maddeningly flavorful broth you are slurping, but also heritage and history. Food, and soup in particular, cannot be accurately depicted without its cultural context. As many of you would agree, a bowl of pho one had a few Friday nights ago somewhere in American suburbia is nowhere near the same thing as a bowl of pho one had squatting on a bright red plastic stool on a street corner in Hanoi. I am not brave enough to try a soup with pork spine, but I did make a delicious sweet potato soup yesterday. Something about snow and cold winter days that just begs for it:). Sweet potato soup is just as brave, and just as hard to perfect! I’ve just found your blog. I’m tired and hungry and I shouldn’t be reading this, but I really love your writing style. I’m having stew for dinner… in your opinion, is stew soups ugly cousin? I wouldn’t say “ugly.” Stew just has more content per liquid. In my mind, stew is the beautiful cousin, good enough to act as a filling meal all by itself. Thanks for visiting!